First Listen: Grizzly Bear, 'Shields' The band's fourth album rewards listeners with strange surprises and a few hooky, expansive ringers. Along the way, it showcases the considerable gifts of four guys willing to hover patiently through the detours, without sacrificing the beauty that makes the journey worthwhile. Grizzly Bear's new album, Shields, comes out Sept. 18.
harmonies, Grizzly Bear can be inscrutable at times: Its members have been known to use their formidable studio chops in the pursuit of what can sound like puzzles waiting to be solved. 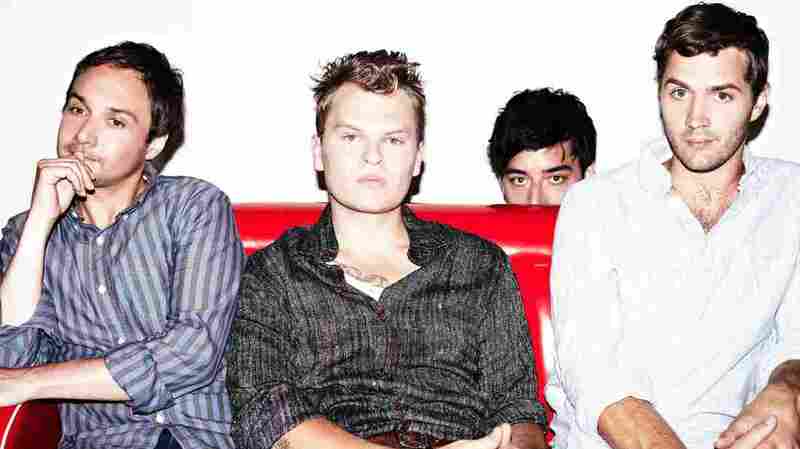 Take "Sleeping Ute," the lead track from Grizzly Bear's fourth album, the follow-up to its 2009 breakthrough Veckatimest. With its lush flourishes and strange psychedelic side roads, the song lurches in about six directions at once, testing listeners who like their songs to travel in straight lines. Shields (out Sept. 18) can be hard to latch onto in spots, but it rewards the effort — with both strange sonic surprises and a few hooky, expansive ringers. With vocals that recall the choirboy-in-a-cavern anthemics of My Morning Jacket, "Half Gate" and especially "Yet Again" find a catchy, agreeable compromise between experimentation and soaring grace. In other spots, Shields gets spare and quiet — particularly in "The Hunt" and "What's Wrong," both of which drift into airy, barely there minimalism. By the time it winds down, the album has found an effective way to fuse its gentle and majestically booming sides in the seven-minute knockout "Sun in Your Eyes." Sometimes delicate and eccentric, at others grandiose — and always many steps beyond the Brooklyn band's beginnings as a home-recording project for singer Ed Droste — Shields rarely sounds like a bid for greater commercial success. But it does showcase the considerable gifts of four guys willing to hover patiently through the detours, without sacrificing the beauty that makes the journey worthwhile.